At some point in the future being able to travel around the world will become relatively cheap. It may not happen in our life times, but at some point being able to travel from London to Sydney might cost as little as $200 and be accomplished in as little as 5 hours. But to do so we will need to rethink and redesign how we travel, what we use as energy sources, and the economics of travel. It seems far fetched right now, and indeed even far fetched within our century - but maybe five centuries from now, when interplanetary travel has become not only possible but regular, that people will be able to travel on Earth with the ease we currently associate with hailing a taxi for a ride uptown. There is a hierarchy to the concept of green transportation. It�s a simple idea, really. 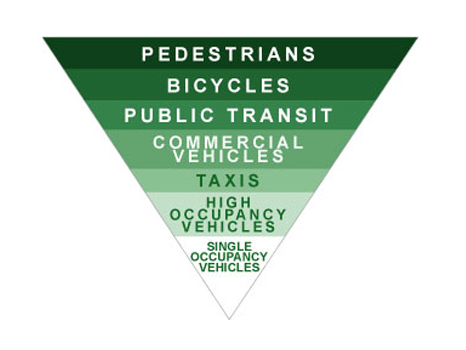 Think of an upside down pyramid, like in the picture below whereby our method of transportation (walking, cycling, public transit, etc) is all gauged by the amount of greenhouse gases produced by using that form of transportation. eg. A bicycle doesn't cause any greenhouses gases except during the manufacturing process, so its by far one of the cleanest methods of transportation you can get. Better than horses in fact because you can lock your bicycle up when you get to work, whereas a horse will need a stable and will produce methane, manure, etc. The goal really of promoting the concept of a Green Transportation Hierarchy is to convince people to reduce their carbon footprint by adopting a greener method of getting to and from work on a daily basis so we are each reducing our carbon footprint, and the more citizens at the pedestrian level, the better for all of us. However if you live way out in the suburbs or even a satellite city, you may not have that option. Indeed your only option may be to drive via car to work if you simply live where there is no public transit and walking / cycling to work is impractical. Some people also choose to walk or cycle to work in order to get in shape, stay fit, live longer, etc, but they really only have that option if they live to close to their workplace. But lest we forget that manufacturing is the backbone of our economy, we must remember again that not everyone can telecommute. Until we devise robots which can build cars, pick berries, sew pants, do all the menial tasks that robotics manufacturers have been claiming their robots could do for decades - well then we will continue to need people in factories doing things by hand. (As it currently stands many of these things are now done by skilled labourers overseas in countries with a standard of living so low it is practically slavery. We can�t walk all the time (especially when you are purchasing a couch or a loveseat) but our need to drive a larger�sized vehicle certainly is not constant. Our challenge therefore is to increase the availability and use of renting or leasing vehicles so people can rent a truck or van only when they need them - or shop at places that offer to deliver. Our next trick is to increase the use of vehicles which are more fuel efficient or use alternative fuels like Hydrogen. 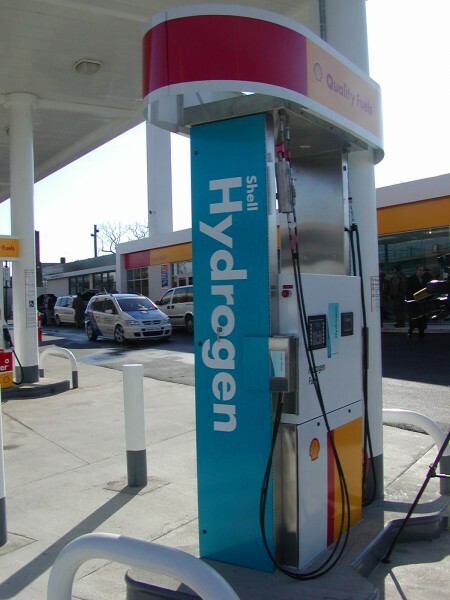 Hydrogen fuel cells are, without a doubt, the future. The problem right now is developing a plan whereby we can add hydrogen fuelling stations to all the existing gas stations across North America and make hydrogen a viable option. Car manufacturers are already in a race to see which company can be the first to bring a hydrogen car to mass market. And once it is available for mass market, work out deals with gasoline dealerships for them to have hydrogen pumps for refuelling. The only trick to hydrogen production is that is the process of creating hydrogen. The process is hydrolysis, which is done by passing an electric current through salt water and it causes hydrogen bubbles to come to the surface. That hydrogen is then syphoned off and shipped to wherever it is needed. However to do all this, we need electricity - and to fuel enough cars for 300 million Americans, we need a lot of electricity. Which means that simultaneously we also need more abundant and stable sources of electricity - and the most efficient way to do that would be to build geothermal electric plants. Just 5 geothermal plants would produce enough electricity for ALL of Canada. Canadians wouldn't even need nuclear, coal, wind or solar. All of Canada's electricity needs can be met with just 5 geothermal plants built in Alberta, Manitoba, Ontario, New Brunwick and Newfoundland. And the only difficult one to build would be the one in Ontario where the earth's crust is a bit thicker. We have the technology to do all these things, but we have chosen not to do it because there is currently no government support for building geothermal plants for electricity and a network of hydrogen refuelling stations. Part of the problem is that we are still stuck in a gasoline mindset. Which means we need to get politicians driving hydrogen cars and then realize the potential for hydrogen cars not only to provide a better solution to our transportation concerns, but also will eventually be the cheaper option than buying our oil from overseas as oil prices continue to skyrocket in the coming decades. We've seen some fabulous improvements in hybrid cars this year and a lot more fanfare from the auto industry regarding hydrogen cars. We look forward to what surprises 2008 will bring us. When you put together the total package -- styling, fit, finish, reliability, long life and heaping helpings of fun to drive, nothing tops the Si for the money. The experts say that the price of petrol is going to do nothing but go up, so we might as well make the best of it. Yes, one has to keep the revs at silly levels to extract all that this car has (0 to 60 mph in about 6.5 seconds) but the Honda fours have always been like that. Add some great handling into the stew, a comfortable and somewhat futuristic interior, and for an affordable price of $22K or so you have our car of the year. Close runner up: Mazda's Mazdaspeed 3. Two very different cars, with similar results -- and that is lots of super car power and excellent handling. The Lambo is in-your-face Italian virility, both in its styling and its performance. If you want to be seen, the Lambo is the way to go and we think the slightly lighter and slightly more powerful Superleggera is the way to do it. The Porsche is a more timeless design and better for those who would like to blend in. That is, until you press down sharply on the pedal. Then the 510 horsepower kicks in with the turbos to propel you to 60 mph and beyond in the time that it takes most people to hiccup. (The Lambo is no slouch either, with 522 horsepower and 60 mph in about 3.4 seconds.) For the well-trained driver on a good track, these cars would be more than breath-taking. For everyday drives on the street, the Porsche would be the way to go. But it would be cool to pick up your old high school sweetheart in a Lambo. Let's face it. When you think about a Bentley, you think of a luxury car fit for carrying a king, a queen or a Hollywood star that does not drive a Prius. 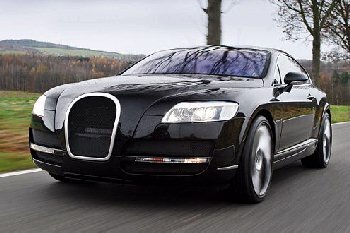 You do not think of a modern day GT super car with a 12-cylinder, 6-liter engine that in its best stage of tune cranks out 600-horsepower and hustles to 60 mph in 4.3 seconds. Not to mention the sleek modern design that turns heads. Price? Well if you must ask, about $190,000, depending on options -- and there are a lot of them. It is one very exclusive way to get where you are going. 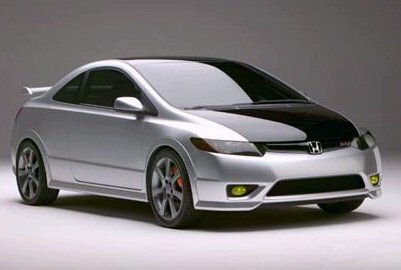 Every four years Honda manages to find a way to make one of the best cars on the road even better. The 2008 Accord is a bit bigger, and passengers in the back seats will love the change. The excellent fit and finish remain, along with good gas mileage and the promise of dependability and long life. Factor in good resale values and the sporty feel of Honda cars in general, and you have the mid-sized class leader (again). Offered as a 4-door sedan or a 4-door hatchback, the Versa offers exceptional room for four and has one of the best CVTs we have driven. Owners say 30 miles per gallon is common on the highway. The price is right, too, starting at $12,630. Keep a lid on the expensive options, and the expected rush to $4 a gallon will seem a much more bearable. GM went after the autobahn cars with its new CTS and snuck a goal into the far right side of the soccer net late in the game. 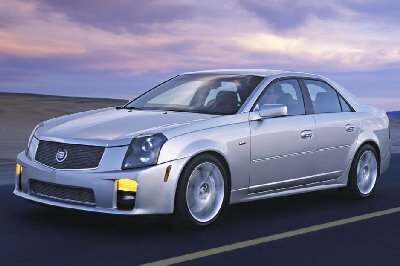 With its in-your-face front end styling, quality interior, crisp handling and 304-horsepower V6, the CTS serves notice that Detroit ain't dead yet. It is a big convertible that rings every luxury chime in the books and adds one -- the optional teak wood surrounding the area where the top folds down. There are wonderful retro touches inside, and the big Rolls grill with the Flying Lady stands out from Detroit to Dubai. The interior of the Saturn Outlook has a luxury car feel to it, something that you could not always say about this brand. It could use a few more horsepower, but the Outlook will haul lots of kids and their stuff. Add in Saturn's way of dealing with customers and its no-nonsense pricing, and we think the brand is on the way back. Its Aura sedan impressed with its handling and quality interior, and we very much look forward to a spin or three in the upcoming entry-level Astra. Both are encouraging looks at what the future might be like without gasoline. They were both comfortable, quiet (since they are electric powered) and eminently practical cars that will meet the real world needs of real customers, assuming that manufacturing costs can be lowered, and a network of hydrogen filling stations can be established. With just water vapor coming out of the pipe, you could be really green in about 2011 or so. BMW 328i: Simply a great car! Leave off the i-drive, which our test car did not have, and you end up with a fun sedan that is ready to hustle you from New York to L.A., or Brussels to Berlin. Mini Cooper S: Power, performance and 29 miles per gallon are just a few reasons to buy one. The main reason, however, is that it's just silly grand fun to drive any Mini anywhere. Volks GTI: The GTI is back and solidly a driver's car again. For less than $30,000 base you get to 60 mph in just over 6 seconds, and will enjoy sports-car handling that is guaranteed to make your palms sweaty. 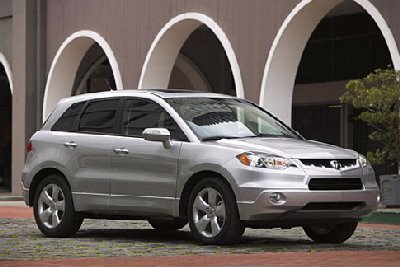 Toyota Highlander: Smooth, powerful, and able to take large loads at a single bound. That's the new Highlander. Its dash panel with large knobs for audio and ventilation should be required reading for all auto design teams. Keep a firm hand on the options, and the new Highlander is a very good value. We look forward to the New Year on the roads, even though it could be a rocky one for the auto makers if the price of gasoline continues to soar and the economy stalls. We will keep you on top of the trends with our gas sipper's updates and never-ending search for fun wheels to get through it all.